12 May 2006: Recognizing that global warming may fast be approaching the point of no return and that the world cannot wait for the US government to act, hundreds of US city mayors have pledged to cut emissions of greenhouse gases. By signing the US Mayors Climate Protection Agreement, these mayors - representing some 44 million Americans - have committed their cities to meet or beat the US emissions reduction target in the Kyoto Protocol, despite the federal government's refusal to ratify that treaty. This grassroots political revolution, spearheaded by Greg Nickels, Mayor of Seattle, Washington, and endorsed by the US Conference of Mayors, responds to the mounting concerns of the American people. 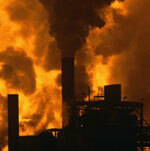 It calls for reducing greenhouse gas emissions to seven per cent below 1990 levels by 2012. As Burlington, Vermont, Mayor Peter Clavelle noted: "We can't wait for this vacuum of leadership to fill." Since 16 February 2005, when the Kyoto Protocol came into effect for the 141 ratifying countries, 227 US cities, including New York, Los Angeles, and Chicago, have joined the mayors' agreement. The Northeast, the Great Lakes Region, and the West Coast are particularly well represented, and the list keeps growing. The cities' action plans vary in content and completeness, but the common refrains include increasing automobile efficiency, improving public transportation systems, curbing sprawl, and encouraging walking and cycling. The plans emphasize using and generating electricity more efficiently, with renewable energy sources playing a prominent role. Seattle's pledge to reduce greenhouse gas emissions translates into an annual cut of 683,000 tons, the equivalent of retiring some 148,000 cars each year. In March 2006, the Mayor's Green Ribbon Commission made numerous recommendations on how to achieve this goal. The local role model is the municipal government, which has already slashed carbon emissions from city operations to more than 60 per cent below 1990 levels. This was achieved in part by switching a share of the government fleet to hybrid-electric vehicles. By cutting fleet fuel use by seven per cent between 1999 and 2005, the city saved at least $300,000 a year. • improve energy efficiency in buildings and require new housing to be energy-efficient. • reduce automobile dependence by broadening the availability of "frequent, reliable, and convenient public transportation" funded in part by new regional toll roads and a new commercial parking tax. • add bike lanes and trails. • improve sidewalks and crossings. • develop "compact, green, urban neighborhoods" built for people, not cars. • encourage greater use of biofuels. • use rooftop solar energy systems and heat pump water heaters. • encourage the use of plug-in hybrid-electric vehicles that can run on electricity (preferably produced by renewable sources) for short trips - virtually an 80+ mile-per-gallon car. Of the other cities signed on to the Mayors Agreement, Portland, Oregon, has one of the most advanced plans for change. In 1993 Portland became the first US city to develop a global warming action plan. Now, together with the rest of Multnomah County, Portland aims to cut greenhouse gas emissions to 10 per cent below 1990 levels by 2010. Had Multnomah County continued with business as usual, today it would be emitting more than 12 million tons of carbon dioxide; because of its deliberate action to reduce greenhouse gases, however, the latest tally shows emissions have fallen to 9.7 million tons-just one per cent above 1990 levels. 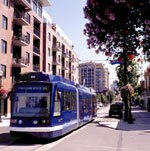 Portland has increased public transit use by 75 per cent since 1990. This was aided in part by the addition of new major light rail lines and the 2001 reinstatement of a central city streetcar. City workers receive monthly bus passes or free car pool parking, and businesses that subsidize employee parking are encouraged to subsidize public transit commutes as well. Portland also has 267 miles (430 kilometers) of bikeways, which it hopes to double within 10 years. In 2002, Multnomah County established energy efficiency standards for "lighting, heating and cooling, appliances, and personal computers." Throughout Portland, traffic signals have been converted to LED (light-emitting diode) bulbs that cut energy use by a whopping 80 per cent, saving the city more than $500,000 each year in energy and maintenance costs. And the city is investigating the possibility of powering all its facilities completely with wind energy. Elsewhere, city and county office buildings in Salt Lake City, Utah, have removed inefficient incandescent light bulbs in favor of compact fluorescents that use a third of the energy and last up to 10 times longer. In chilly St. Paul, Minnesota, an efficient combined heat and power system warms most downtown buildings. In Washington, DC, 414 diesel buses have been replaced with ones that burn cleaner compressed natural gas. Austin, Texas, is quickly turning to wind and solar power to reach its goal of meeting 20 per cent of its energy needs from renewable sources and 15 per cent through energy efficiency improvements by 2020. Response to the Washington climate action void is not limited to cities. States and businesses also are taking part. The challenge now is to multiply these initiatives and take them farther. With the US making up 5 per cent of the global population but responsible for a quarter of the world's greenhouse gas emissions, there is no substitute for leadership from the top. It’s not easy being green  for a city, that is. It's tough enough to simply keep up with the endless trash, traffic and pollution generated by urban life. To actually get the better of it with good public transportation, smart recycling programs and the kind of well-kept streets, parks and playgrounds that make cities fun and healthy places to live, that’s the true challenge. Homestore, the American real estate portal, selected the ten greenest US cities.